Bailie ("bayle") of Barcelona, Spain, and brother of Naḥmanides (whose secular name was Bon Astruc de Porta; see Grätz, "Gesch. der Juden," vii. 38; "Jewish Quarterly Review," viii. 492, 710). Benveniste was an important capitalist of Barcelona and advanced money to King Jaime I. of Aragon, mainly on the security of the municipal dues owed to the king. Thus on Dec. 17, 1257, he advanced 3,863 sueldos on the dues of his bailiwick (Jacobs, "Sources," No. 134); and on the 15th of the following month he received the right to sell the dues of Barcelona and Gerona for two years (ib. No. 142). The total indebtedness of the king was no less than 199,483 sueldos (ib. No. 144), which Benveniste was allowed to recover by taking the dues of Lerida and other places of his bailiwick (ib. 162). 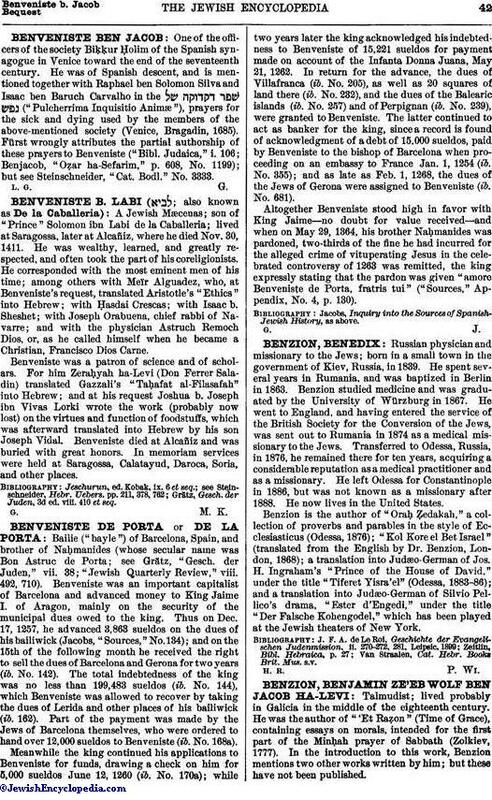 Part of the payment was made by the Jews of Barcelona themselves, who were ordered to hand over 12,000 sueldos to Benveniste (ib. No. 168a). Meanwhile the king continued his applications to Benveniste for funds, drawing a check on him for 5,000 sueldos June 12, 1260 (ib. No. 170a); while two years later the king acknowledged his indebtedness to Benveniste of 15,221 sueldos for payment made on account of the Infanta Donna Juana, May 21, 1262. In return for the advance, the dues of Villafranca (ib. No. 205), as well as 20 squares of land there (ib. No. 232), and the dues of the Balearic islands (ib. No. 257) and of Perpignan (ib. No. 239), were granted to Benveniste. The latter continued to act as banker for the king, since a record is found of acknowledgment of a debt of 15,000 sueldos, paid by Benveniste to the bishop of Barcelona when proceeding on an embassy to France Jan. 1, 1254 (ib. No. 355); and as late as Feb. 1, 1268, the dues of the Jews of Gerona were assigned to Benveniste (ib. No. 681). Altogether Benveniste stood high in favor with King Jaime-no doubt for value received-and when on May 29, 1364, his brother Naḥmanides was pardoned, two-thirds of the fine he had incurred for the alleged crime of vituperating Jesus in the celebrated controversy of 1263 was remitted, the king expressly stating that the pardon was given "amore Benveniste de Porta, fratris tui" ("Sources," Appendix, No. 4, p. 130). Jacobs, Inquiry into the Sources of Spanish-Jewish History, as above.